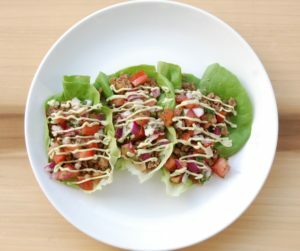 This is a versatile weekly staple recipe for walnut ground meat lettuce wraps and it makes enough for about 4 meals or if you eat like me 2 meals. Combine all ingredients in to a food processor and pulse several times until mixture becomes just crumbly. Pour in to glass containers and store refrigerated up 4 days until ready to use! Add in desired seasonings and enjoy! Seasoning Blend Suggestions: Mexican: Chili Powder, Oregano, Cumin, Pepper, Lime Serve in Lettuce Boats Topped with fresh salsa and Guacamole! Italian: Oregano, Garlic, Thyme, Basil, Marjoram (Or Premixed Italian seasoning) Serve over zucchini noodles with some olive oil and sliced basil or quick homemade marinara sauce. If you would like to make meat balls: Add 2 Tablespoons of freshly ground flax and 2 tablespoons of water to the walnut base and form balls. Dehydrate at 115 degrees for about 1 hour. Curry: Curry Powder, Turmeric. (Goes awesome with coconut curry!) Over Black Bean Pasta or Kelp Noodles. This recipe is super easy to make. It is an excellent make ahead base that can be used in so many different ways. I prepare a big batch of the walnut mixture early in the week without any added seasoning. Then I can take individual servings out as I need to and mix in the spices that go with whatever dish I am making. For example, on our taco night I add cumin, oregano, chili powder, and cayenne. Then later in the week I will make “meat balls” to have over my Italian style zucchini pasta simply by adding basil, thyme, oregano, and garlic. So essentially I only have to dirty one set of dishes to make a variety of different meals for most of the week. So simple, yet so delicious and tasty creating a variety of different meals througout the week!